The Santa Vittoria cooperative was founded in 1979 and, following an initial period in the Cadeo area in a rented cheese dairy, it moved to Carpaneto Piacentino in 1991. Over the years, in a huge area, it has built a cheese dairy, a warehouse, offices and a factory shop open to the public, currently employing a total of 22 people workers. We are welcomed by the director Giuseppe Rizzi, who begins to tell us how Grana Padano is made by processing the milk supplied by the 21 members of the cooperative, all from the Piacenza area. He also tells us that the PDO cheese is the main ingredient in many characteristic local dishes, such as “anolini in broth”, “pisarei e fasoi” (pasta and bread crumbs small gnocchi with borlotti beans), and “Piacenza-style tortelli with ricotta and spinach”. The director accompanies us into the “milk room”, where we meet the very young cheesemaker, Matteo, who is only 24 years old. Having performed other duties in the cheese plant for 5 years, Matteo then followed in the footsteps of his father Franco, the previous cheesemaker of Santa Vittoria. We watch him while he performs an extremely important task: breaking the curd. We then go into the shaping room, where the cheese is first placed in moulds of suitable plastic material and then in steel moulds so that they take on a cylindrical shape. No less than 400 wheels are laid out on trolleys, using a system that saves on space and labour. After 3 days, the wheels are immersed in brine, where they remain for 17 to 18 days. In this room, re-modernised in 2011, we meet Luigi, a 29 year-old who has been working in the dairy for six and a half years. We watch him as he turns the wheels to ensure that the brine is properly distributed. Once the salting phase is finished, the wheels are transferred to the warehouse. Here, among the wheels left to rest, we are welcomed by the President of the cooperative, Fausto Gandolfi, who tells us about the authenticity of the product and about the introduction of production standards, impressing on us the importance of protecting everything that has been achieved over the years. 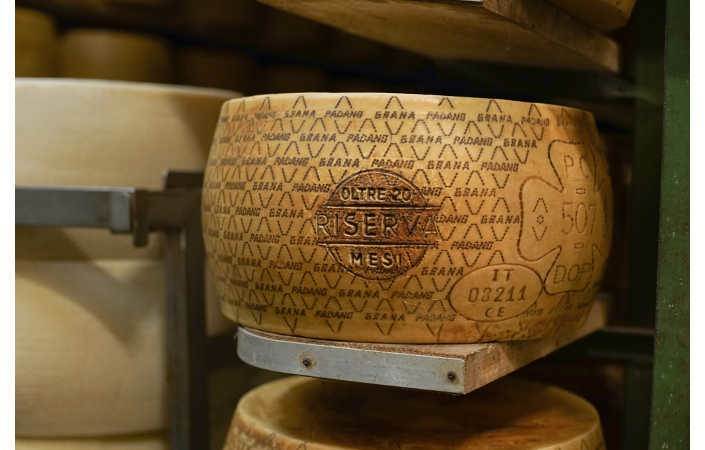 This means ensuring a maximum focus on quality, also because Grana Padano is a certified product and must meet certain requisites to guarantee its authenticity, quality and safety. Our visit ends in the factory shop, where we meet Simonetta, who has been selling the cooperative’s cheese, and other local products, for the last 30 years. In fact, in addition to Grana Padano PDO, here visitors can also purchase many other dairy products, including butter, ricotta and caciotta, as well as other products like organic honey, wine and PDO cured meats, such as coppa piacentina. The pride and joy of the factory shop is the Grana Padano PDO cheese matured for over 30 months, a product that makes the Santa Vittoria cheese dairy a Mecca for gourmet food enthusiasts. next: Santangiolina Latte Fattorie Lombarde Soc. Agr. Coop.